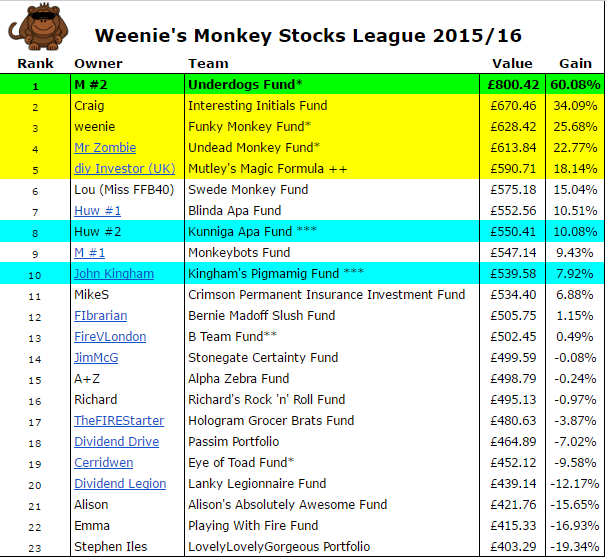 Monkey Stocks League Winner 2016! 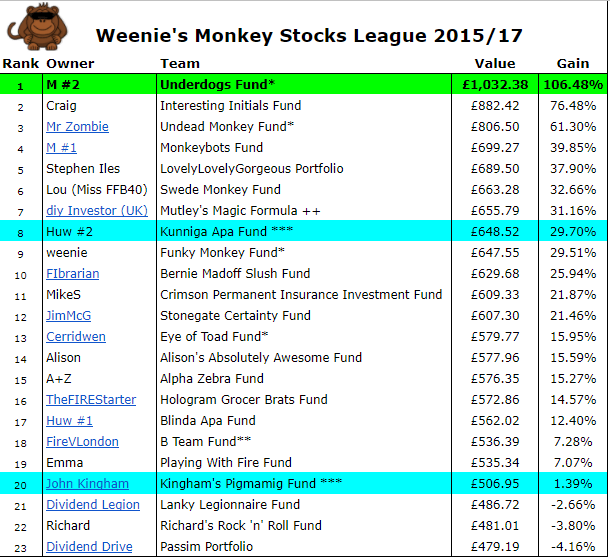 Twelve months have flown by since I started the Monkey Stocks League Challenge and I can now announce that the winner is…..
Runners-up Craig and his Interesting Initials Fund just couldn’t get anywhere near the winner. 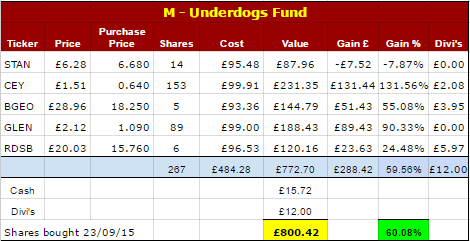 The Underdogs Fund showed a gain of over 60%, or rather £300 profit on M’s original investment of £500. M’s shares were chosen based on the Dogs of the FTSE strategy, all shares with high yields. The portfolio’s only ‘blip’ were the shares in Standard Chartered, one of the many banks which suffered big losses this year, cutting their dividend completely. 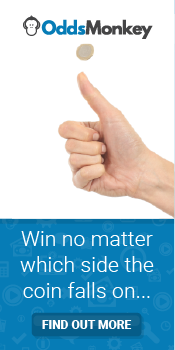 Can’t win ’em all, eh M? I must say that I am well chuffed that I not only finished in the top 3 but that my stocks showed a gain of nearly 26%. 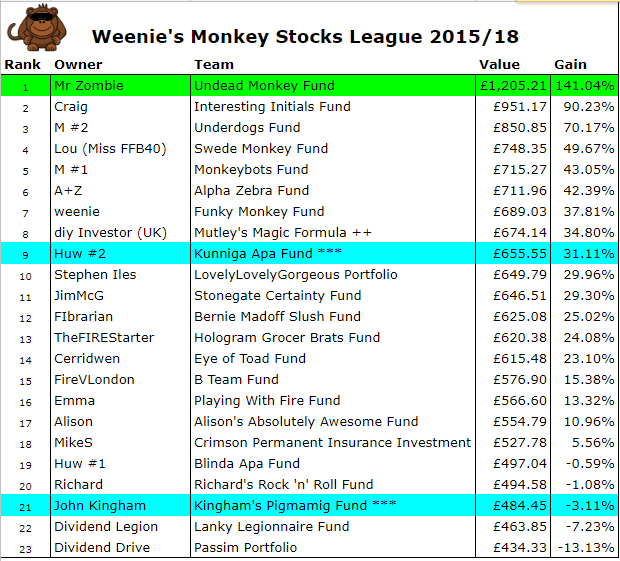 Mr Z can’t be too unhappy that his Undead Monkey Fund came 4th, with a gain of nearly 23%. FireVLondon’s B Team Fund ended up pretty much just breaking even, with Cerridwen’s Eye of Toad Fund down by around 10%. Many thanks to all of you who bought your stocks for real to join me in my mad experiment! 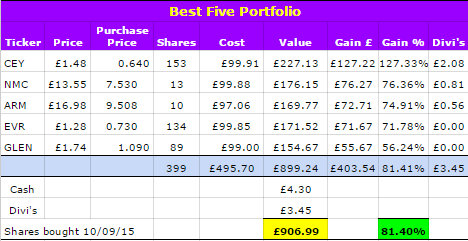 Ok, so both expertly chosen funds finished in the top 10 but still, both were miles from the winning portfolios. In the duel between the experts, Huw came out on top, with his portfolio Kunniga Apa finishing in 8th place, with a gain of 10%. Incidentally, his Monkey Stocks fund, Blinda Apa, finished one place above! 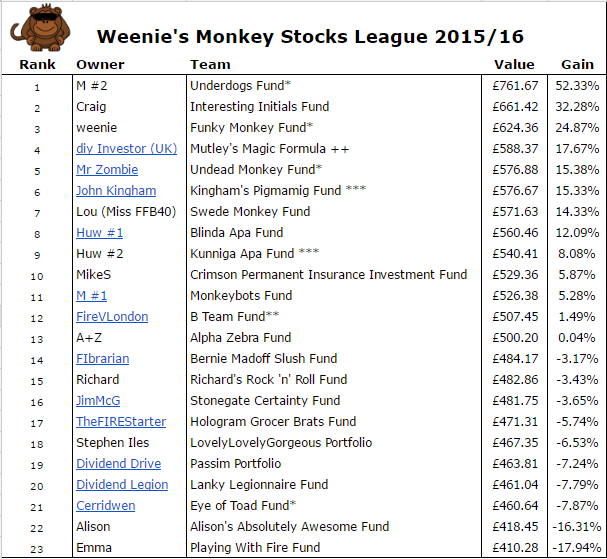 John Kingham’s Pigmamig Fund finished in 10th place, with a gain of nearly 8%. However, it was interesting to note that John’s portfolio scored the highest total dividend paid – over time, reinvesting dividend income plays a huge part in investment success, so John had obviously picked his stocks for the long-term. 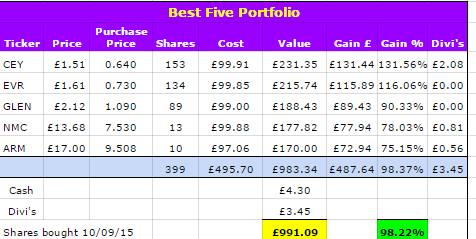 diy’s Mutley’s Magic Formula fund continued to maintain its steady process and finished 5th. This fund was based on Vanguard’s 60% LifeStrategy Fund and steadliy made gains (18% in the end) with relatively little volatility. 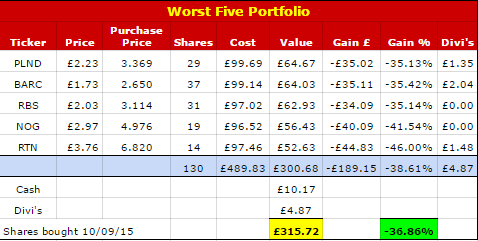 If someone had happened to pick all these shares for their portfolio, they would have nearly doubled their initial investment of £500! The worst 5 performing shares were Royal Bank of Scotland, Nostrum Oil & Gas plc, Restaurant Group, Interserve plc and Barclays plc. If you’d had the misfortune to pick this lot, you would have seen your portfolio value drop by over 40% – ouch!